With some help from the tech guys over at Worden I was able to get Martin Zweig's Breadth Thrust indicator running on Stock Finder. You can download the layout by going to "Share", then "Browse Other Users Shared Items". Then scroll down to "PatientFisherman_BreadthThrust". "A Breadth Thrust signal occurs when this indicator goes from under .40 to above 0.615 within a 10-day time period or less" - The Complete Guide to Market Breadth Indicators. I went ahead and added an indicator for Breadth Thrust Continuation - "..signal is given whenever it goes above 0.615 without the requirement for it to come from below 0.40 in 10 days." These examples are for educational purposes only. so we can't do this using TeleChart? Refer to this link for a detailed description of all Telechart indicators. Wondering if Stockbee Market Monitor can be used in Stock Finder ? You can show points of breadth thrust (like guru's top25 / EP signals) in the chart by adding following real code as an indicator. Here AdAp references the breadth thrust indicator from the chart. Excellent! Thanks sp. I updated the layout. 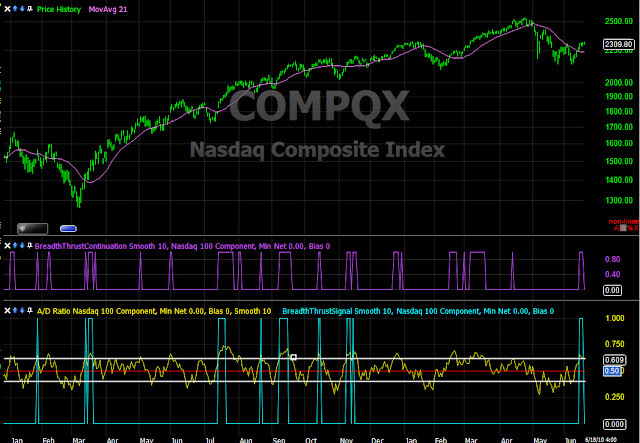 I went ahead and added a indicator for Breadth Thrust Continuation which is "..signal is given whenever it goes above 0.615 without the requirement for it to come from below 0.40 in 10 days." http://bit.ly/av9JEy this person has plotted a modified Market Monitor kind breadth indicator on each Index using Stock Finder. He changed 13/34 to 15/30. What is the actual syntax to add the Breadth Thrust Continuation to Stockfinder? I entered both lines above as a RealCode Indicator and received an error (Name 'AdAp' is not declared) when I clicked 'Apply'. I then entered just the condition statement and received the message 'There are compiler errors'. The Breadth Thrust Continuation Indicator is listed as an indicator in an open pane, but not plotted. RealTrader, did you download the layout in StockFinder? 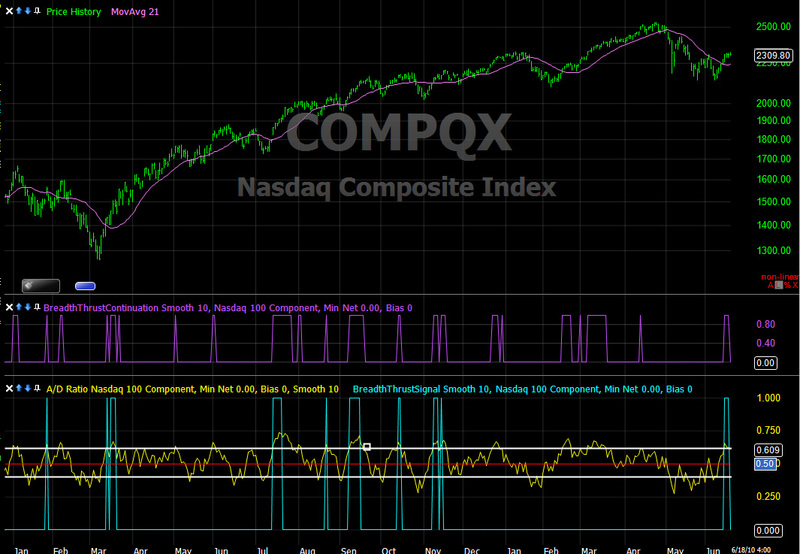 The code provided by sp is just the indicator that is dependent on the Breadth Thrust indicator to be in the system. Let me know.